KCCA team that started against CNaPS Sport yesterday. KCCA FC went down 2-1 against CNaPS Sport FC in the first round of the CAF Champions League preliminary round at Vontovorona stadium Madagascar. This was the Kasasiro Boys seventh successive loss away from home on the continent despite taking a second half lead thanks to in-form striker Derrick Nsibambi. 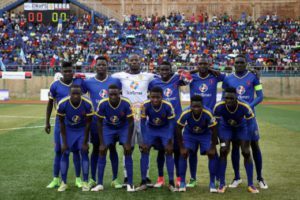 KCCA conceded only seven minutes after taking the lead when Filbert Obenchan handled in the penalty area and Fenosoa Ratolojanahary converted the resulting penalty kick. With a minute to play in added time, Francis Rafaralahy headed CNaPS’ second goal from Lalaina Jacquot’s cross to give the hosts a 2-1 win. Mike Mutebi’s charges have to find a winning formula on their travels as it also was their undoing last season in both the CAF Champions league and Confederations cup. Against Mamelodi Sundowns in the Champions league first round, KCCA lost 2-1 in South Africa before drawing 1-1 at Lugogo and in the due course eliminated 3-2 on aggregate. When they reached the group stages of the Confederations cup, the Kasasiro Boys lost all three of their away games in group A including a 4-0 loss to Club Africain in the last game and they where eliminated on goal difference despite finishing level on points with Morocco’s FUS Rabbat. With at least a point in one of their away games during the CAF confederations cup, KCCA would have surely gone into the quarter finals. If they are to perform better this time round, they will need to work on their travels clearly. KCCA and CNaPS will tussle it out in the second leg on the 21st February 2018 at StartTimes stadium, Lugogo. Charles Lukwago (GK), Habib Kavuma, Lawrence Bukenya, Awany Timothy ©, Derrick Nsibambi, Mustaffa Kizza, Shaban Muhammad, Poloto Julius, Allan Okello, Filbert Obenchan.